Third Iron and OCLC work together to automatically sync holdings for our mutual customers. 1. In the WorldShare interface, click the Metadata tab. 2. In the left navigation, click Collection Manager. 5. Select the “Download Authentication” tab. 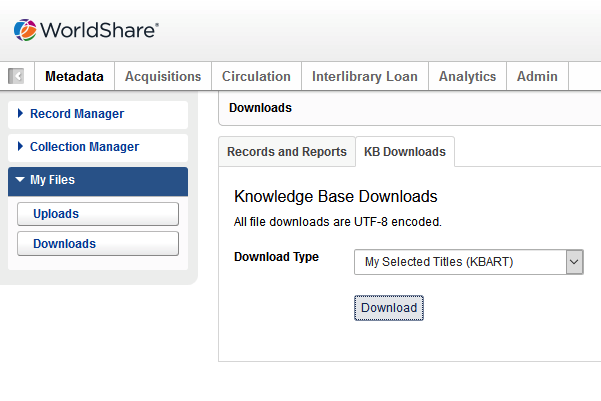 You will be provided with the KBART txt file location, as well as choose whether to limit download access by IP range. 6. Please send an email to support@thirdiron.com explaining you are setting up OCLC automated holdings. You will need to provide the KBART file location url. If you choose to limit Download Access by IP then please also request the IP address for our Third Iron servers. 7. Next, within about 10 days, Third Iron will have automated access to your holdings files. We will confirm once the initial file has been pulled and processed. From there forward, the file will be pulled and processed automatically on a monthly basis. For OCLC, the procedure is simply to navigate in the admin panel in your Worldcat Knowledge base or WorldShare Management Services Interface as shown in the steps and screenshot below.